In 2014, after a stealth BLM roundup, Mark Boone Junior and I rescued the Dry Creek Wild Horses back from the Canadian slaughterhouse yard. All the wild horses from their herd, over the age of 2, had been quickly slaughtered at the plant right after the roundup. These youngsters were going to be live shipped to Asia for sashimi. We rescued them before they were sent to the Canadian airport. 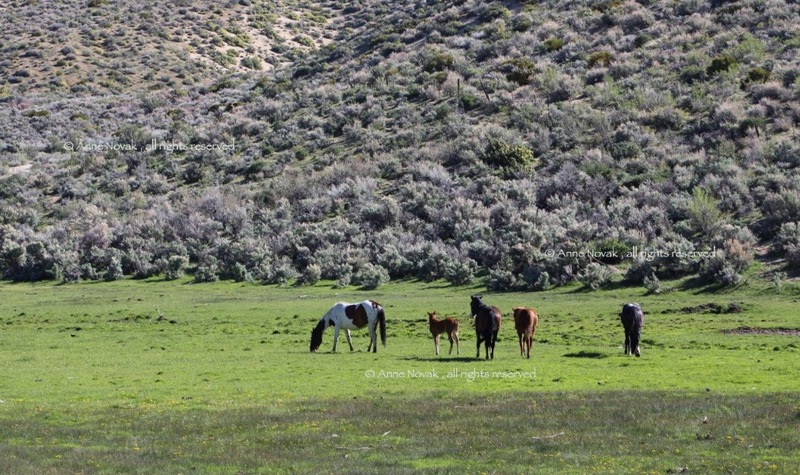 Now the WY14™ Wild Horses live in sanctuary on 270 rented biodiverse acres with ponds, meadows for grazing, spring-fed creeks, hills, buttes and their families. There are 4 bands and one of them is a bachelor band just like in the wild. Their board on the ranch is paid monthly. GFM and the disbursement company take about 10% so the total the WY14™ Wild Horse herd needs to raise is $3,300. We raise money for their board monthly through crowdfunding so everyone can be a part of their life. Every dollar counts and they all add up to meet the WY14™'s goal. We are looking for someone to help us with a capital land campaign or someone who can find a land donation suitable for the WY14™ Wild Horses. Please contact me if you can help. 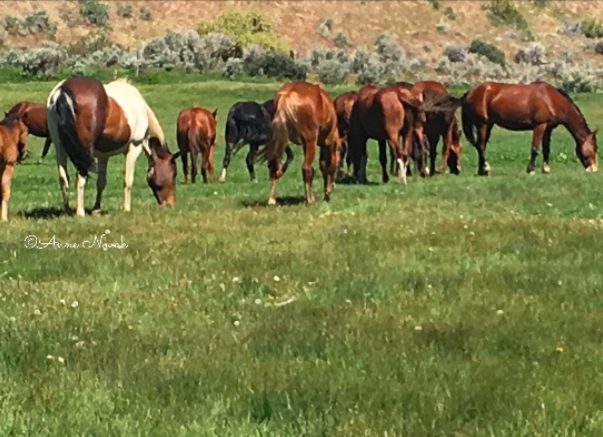 Meanwhile the WY14™ Wild Horses are boarding on 270 biodiverse acres where they are able to live in a natural setting--so happy and definitely healing from the trauma of the Wyoming roundup and loss. Please donate today for their September board which includes grazing. The 270 acre terrain is varied from spring fed creeks and ponds to meadows and sagebrush, trees to hills and buttes. This is a good place for them. The vet, VIP visitors, and others have observed how happy they are. This is a grassroots project. This is a very important project and we are volunteers. All the money raised goes to the WY14™'s monthly board on the 270 acres. The American Wild Horse Institute is a 501(c)3 nonprofit organization dedicated to the education about and the preservation of America's last wild horses. Our Tax ID is 46-4516347. 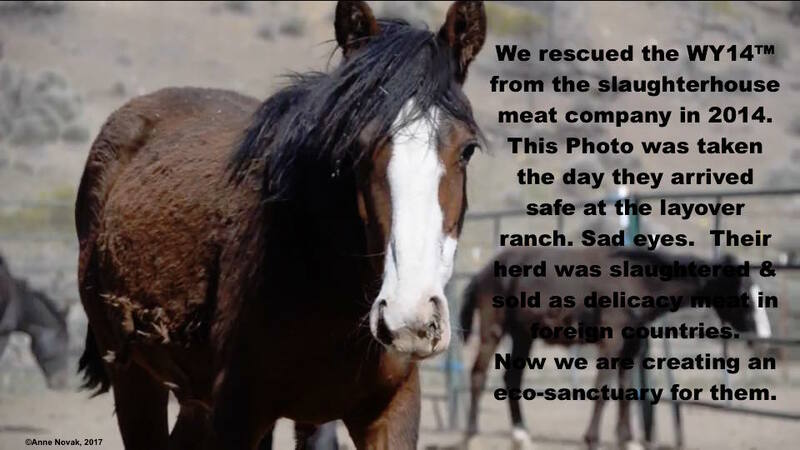 Donate today to make a difference in the lives of the amazing wild horses rescued back from the slaughterhouse yard. Thank you and Bless you! TEARS of JOY and Relief! Thank you so much for helping the WY14™ Wild Horses pay their September Board. God Bless you all! 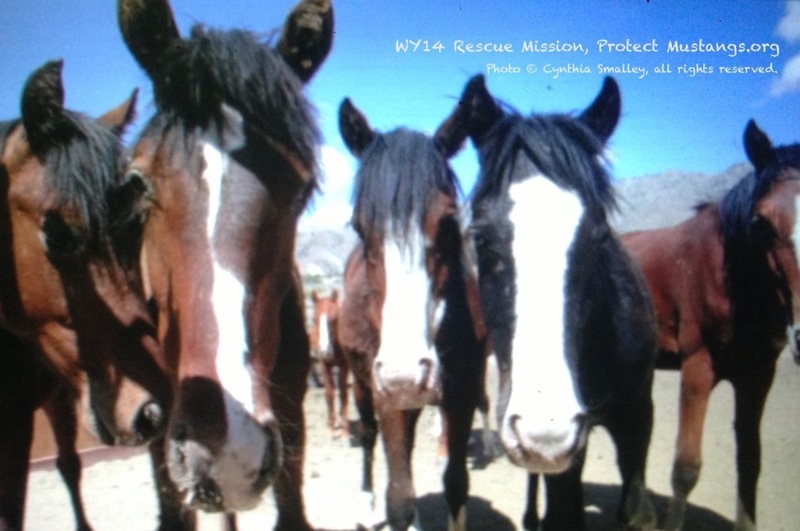 The WY14™ Wild Horses are SO GRATEFUL you are helping them! They are so grateful and thankful. They send you so much LOVE. Urgent: $185 is left to raise for the WY14™ Wild Horses past due September board. Please Donate so they can finish their fundraiser before the check arrives today! The clock is ticking and they are so close thanks to all you wonderful people who love them. 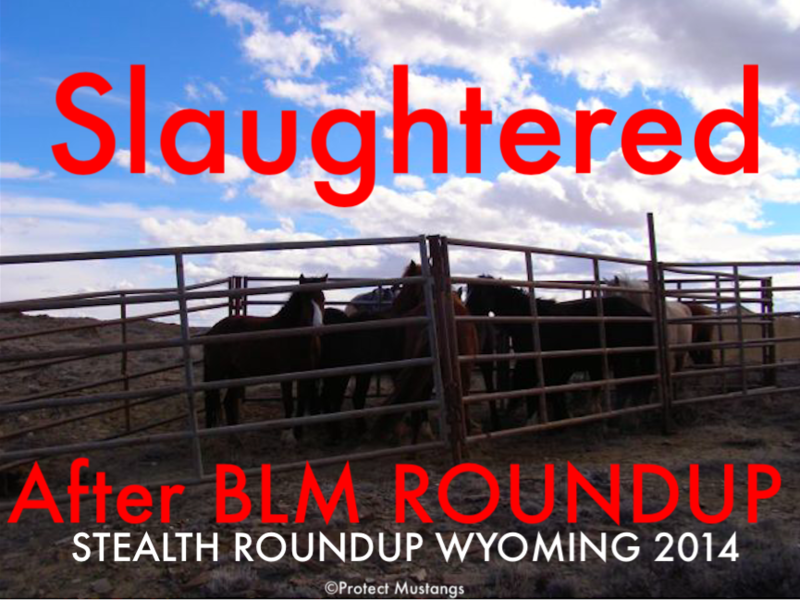 They have been healing from the 2014 stealth BLM roundup that sent the majority of their herd in Wyoming to SLAUGHTER. Cruel Roundup then Slaughter in Canada. HORRIBLE! The check is being delivered to the Ranch owner Tuesday. Please donate now! This is Urgent! The WY14™ are so thankful that you are helping them. They send you so much love and look forward to you visiting them in the future. They send you their LOVE and Gratitude. I'm praying and grateful for everyone's help on the WY14™'s crowdfunding campaign. RED ALERT: $450. is left for the WY14™ to raise tonight PLEASE HELP! I pray they will raise the money in time! The clock is ticking. . . Please Donate! 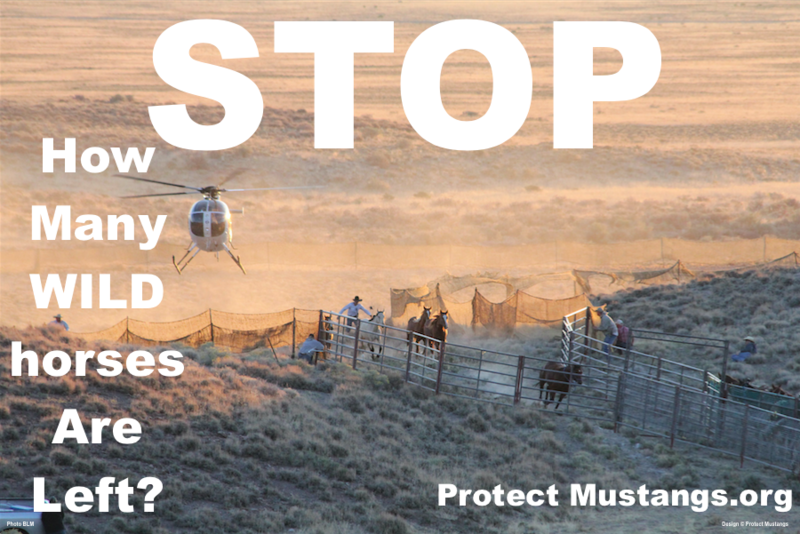 BLM wants to wipe out America's last wild horses. Helicopter roundups are happening now. They want to wipe out the species! The WY14™ preservation project is more important than we ever imagined. Please click here to Donate: https://www.gofundme.com/KeepWY14Safe and Share! Thank you and bless you!